Starbucks in back in the center of a controversy after a Philadelphia Starbucks employee was accused of imitating a customer's stutter by printing the name, "Sam" with two extra "S's". The employee is no longer with the company, Starbucks says. For the second time this year, a Philadelphia Starbucks is at the center of controversy after a worker was accused of mocking a man with a stutter. Tan Lekwijit said the incident began when his friend Sam visited the Starbucks on 34th and Walnut streets in University City back on June 27. According to Lekwijit, Sam, a 28-year-old University of Pennsylvania graduate student who has a stutter, stuttered when he told the barista his name after he ordered a coffee. 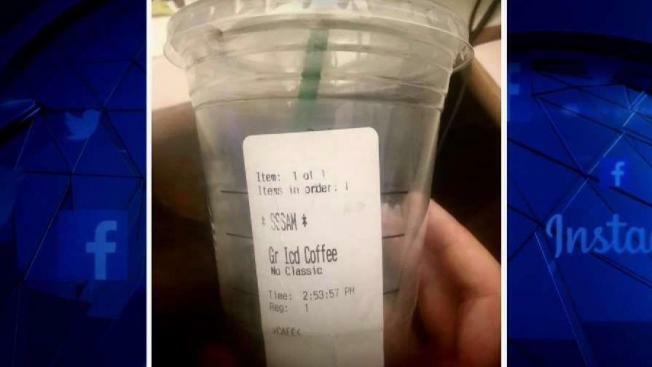 The barista allegedly replied by saying, “Okay, S-S-S-Sam.” Lekwijit said the mockery continued when Sam received his coffee and saw the name the barista wrote on the cup. “His name on the cup was written as 'SSSAM,' which was disrespectful,” Lekwijit said. According to Lekwijit, Sam wrote an email to Starbucks Customer Service after the incident. Lekwijit said Starbucks responded via email, apologizing that he “felt disrespected” for the way they wrote his name. He also said they offered Sam $5. “Clearly, Starbucks missed the point. It was about how you treat people with speech impairments, not how you write names,” Lekwijit said. Lekwijit wrote about the incident on Facebook, stating that he wanted to raise awareness for people with speech disorders. “Getting this kind of treatment from people, especially service employees, only scars them—and I beg Starbucks employees to have this in mind,” Lekwijit said. Lekwijit also claimed he posted on Starbucks’ Facebook page about the incident but they deleted his post. Starbucks replied to Lekwijit’s Facebook post on his own page however. Starbucks Regional Vice President Camille Hymes also said they are taking the incident seriously and have launched an investigation. Starbucks said in a Facebook post that the worker is no longer with the company. The National Stuttering Association also responded to the alleged incident. NBC10 reached out to Starbucks for further comment. We have not yet heard back from them. The controversy is occurring only a few months after another Philadelphia Starbucks, located in Center City, came under fire when a manager called police on two black men who were waiting for a colleague but didn’t buy anything. Viral video of the arrest led to national outrage as well as major policy changes for Starbucks, including unconscious bias training and a new policy that allows anyone to sit in its cafes or use its restrooms — even if they don't purchase anything.